Alaska is a land best experienced by doing. Hike its craggy mountains, bike its roads that beckon you onward with view after stunning view, kayak its pristine waters, and boat next to a calving glacier, waiting for the sharp crack! that will echo in your memories for years to come. This land of the midnight sun can make your heart race as you come eye-to-eye with a 30-ton humpback whale and still your senses as you savor the freshest salmon you’ve ever tasted before unwinding in the comforts of a rustic resort. The 650,000-acre Kenai Fjords National Park is ready to amaze. Are you ready to accept? Many Alaskans joke that there are two seasons in the “Great White North” – Summer and Winter! While each of the four distinct seasons offer their own special surprises (even the short “shoulder” seasons of spring and fall), we recommend Alaska adventure travel between the months of May and September to take advantage of the longer daylight hours and warmer temperatures, although winter can be a treat to the lover of winter sports! While Alaska does indeed have four distinct seasons, it may seem that a snowy, cold winter melts straight into a balmy summer, and then morphs straight back to a winter wonderland, all in the blink of an eye! While the winter may be a bit too chilly (and dark for that matter) for the normal explorer, late spring and early fall can be lovely times of year – assuming the weather cooperates (you just never know in Alaska!) Read on for a breakdown of the seasons and what time of year best fits your Alaska adventure travel. While the beginning of spring (March and April) may be a bit too cold to travel, mid-May onward is a great time to visit Alaska as winter merges into spring. In May, you’ll come across temperatures in the 50s and lower 60s (°F), as well as some spring showers (and maybe even a late spring snowfall!) The daylight hours are also beginning to lengthen, giving you a chance to explore late into the day. We consider this time of year the peak season to travel in the “Land of the Midnight Sun.” You’ll find summer temperatures to be surprisingly pleasant – anywhere from highs in the 60°F to 80°F range. Just because it’s summer doesn’t mean it won’t rain though. Be sure to pack quality rain gear at any time of year, but especially in the summer time! June 21st is the longest day of the year, averaging 20 hours of daylight. You’ll never want to stop adventuring when the sun barely dips below the horizon! While Alaskan winters, cold and dark, may not be your cup of tea, there is actually quite a lot still happening for the adventurous traveler looking for a unique vacation. If you enjoy winter activities; downhill, cross-country and backcountry skiing are prevalent, as is snowshoeing, snowmobiling, dog sledding, and ice skating. You also have the greatest chance of viewing the aurora borealis. Wondering What to Pack on Your Alaska Vacation? Packing for Alaskan adventure vacations can be tough because no matter what time of year you travel, you need to prepare for sunshine, rain, wind, and maybe even snow sometimes all in the same day! (Eek!) Don’t worry, we’ve got a few great tips below for packing efficiently for your adventure. If It’s Waterproof, Pack It. We are not exaggerating when we say it can rain anytime on your Alaska vacation. This big, beautiful state is a true adventure destination and the weather (both the sun and the rain) is a big part of that! We recommend bringing along your waterproof hiking boots and a waterproof/breathable rain jacket and pants. Also, extra socks are a good idea – you very well could go through two pairs in a day if they get soaked early on (nobody likes to hike in wet socks)! It may sound like you need to pack your entire wardrobe to prepare for unpredictable Alaska weather, but really, just a handful of layers ought to keep you warm or cool, depending on the temperature. You will want to bring both pants and shorts (it can actually get quite warm in Alaska) as well as a variety of tops for layering. Bring multiple under shirtsbut just one or two of the following tops to layer: moisture-wicking long sleeve shirt, heavy weight fleece pullover or jacket, and a waterproof rain jacket or shell. A pair of long underwear is nice to have too. You’ll want to refer to the Packing List in your Pre-Trip Planner for further recommendations on what to pack. No Need for Formal Wear. We already discussed protection from rain, but what about the other elements? You’ll want to bring along a lightweight, brimmed hat (for sun and rain), sunscreen, as well as sunglasses with UV protection. On the flip side, it can also be very cold (especially when you’re on any kind of boat moving at a brisk pace), so we recommend packing a warm hat, gloves, and some sort of scarf or balaclava for face protection. Our Alaska Adventure tours are among our best-selling vacations and rightfully so! Alaska has earned its reputation as an adventurer’s paradise because it has everything a traveler looks for in a vacation destination: mountains, wildlife, ocean, a wide variety of activities, and friendly locals. Alaska is a wildlife mecca, and as long as you keep your eyes peeled, you’re guaranteed to spot a number of the fauna that call this big state home. Not only can you spot Alaska’s typical land creatures bears, moose, mountain goats, bald eagles and much more, but you also have a wide array of ocean life to spot whales, otters, sea lions, puffins, seals – the list goes on and on. Your guides will teach you about the wildlife you spot and will help you see, photograph and observe (at a safe distance!) the exemplary range of species that Alaska is famous for. 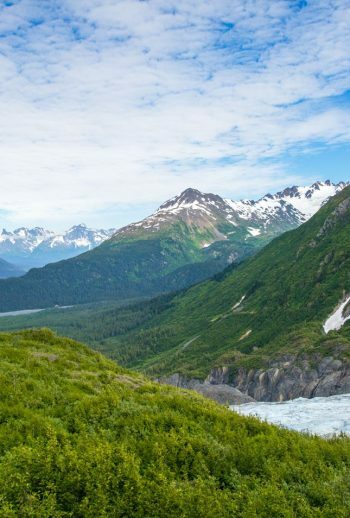 Alaska is an enormous state (over twice the size of Texas), and it can be difficult to know what you should see and do on your upcoming Alaska vacation. Never fear, the experts are here! We have exceptional Alaska Adventure tours that give you a land and sea-based combo experience on the Kenai Peninsula, and we also offer a cruise-based journey that takes you between Sitka and Juneau with a stopover in Glacier Bay National Park along the way. Because Alaska is so huge, it’s much easier to focus on small regions that deliver tremendous adventure potential. We can help pick what’s best for you! We can’t emphasize enough to prepare yourself for any kind of weather (sun, wind, rain, sleet, even snow!). While this can be tough since you can’t pack your whole closet, packing layers that you can pile on or strip down will allow you that extra room in your suitcase for some much-needed accessories (like a hat, gloves, and long underwear). You’ll want to remember your waterproof gear (coat, pants, and boots) as it can rain at any time of the summer!